Increasingly popular today, numerology is an ancient tradition that has engaged the interest of many of civilization's greatest minds. There is evidence that numerology was in use thousands of years ago in China, Greece, Rome, and Egypt â�� long before the time of Pythagoras, who is generally accepted as the "father" of numerology. Most of the earliest teachings were transmitted orally, only to the initiated, because the information was considered very powerful and sacred. Pythagoras was considered a master mathematician. Born in Greece in the 6th century B.C., he demonstrated a natural gift with numbers. Many people are familiar with his theorems in geometry. However, he is also considered to be the Father of Modern Numerology. It has been recorded that he spent many years of study in Egypt and other parts of the world learning the ancient science of numbers. He later brought this knowledge back to Greece, where he taught for nearly forty years, and established a college and philosophy of numbers that would bear his name to this very day. It was said that Pythagoras taught in secret. That each student, selected with care, had to go through a five-year period of perfect silence for the purpose of contemplation to develop a deep sense of faith. Furthermore, his students had to commit his teachings to memory, for it was forbidden to put any of it in writing. It was only after his death, around the year 500 B.C., that his faithful followers broke with this tradition. Pythagoras' belief that reality is mathematical â�� that order is created out of chaos through numbers â�� is the principle on which numerology is founded. Numerologists believe that everything, including abstract concepts, can be converted into numbers and that those numbers have specific meanings. By finding the number value of any word or name, you can discover its hidden meaning. The teachings of Pythagoras were taken up by Plato and reinforced by the writings of the Jewish Cabala. Continued interest by early Christian scholars, such as St. Augustine, led to the widespread use of numerology during the Renaissance. 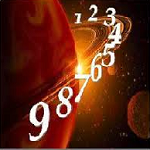 At that time, numerology was accepted by everyone from the most learned academics to the least educated laymen. Numerology, along with astrology, Tarot, the I Ching, and other occult arts, has experienced a revival in recent years. For their readings, modern numerologists have adopted the original Pythagorean system. It is a simple system that assigns a number value (from one to nine) to every letter of the alphabet: A is 1, B is 2, and so on. In standard addition, you add 7+8=15 for the correct answer. In Numerology, this is not enough: it uses a further method of addition known as the "Fadic" system, or "natural addition." This simply means you keep adding two or more numbers together until you arrive at one single digit. Taking our example of 78, 7+8 adds up to 15, but in Numerology you add 1+5, for a final answer of 6. You must then know what each number from 1 to 9 represents.